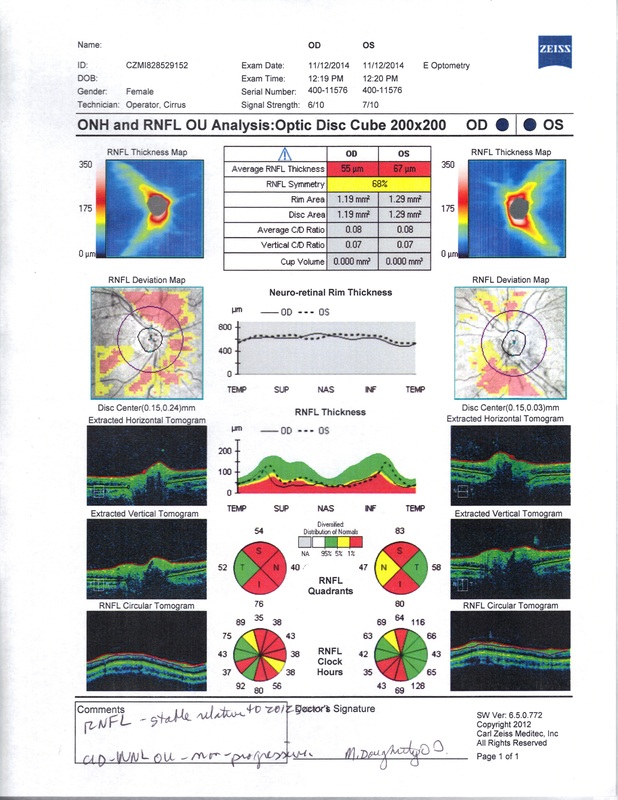 The above is a compilation of all the OCT scans I’ve had so far, showing the “pie slices” of my retinal nerve fiber layer (RNFL). As usual, the display is opposite what intuition would tell you: the left hand side is the right eye, the right hand side is the left eye. Red is bad, green is good. One can see a very slow degradation in the right eye, but changes in the left are a bit less obvious. As an aside: Do you see those (mostly) adjacent slices of green in both eyes (a quadrant of green to the left side on the right eye, and to the right side in the left eye)? 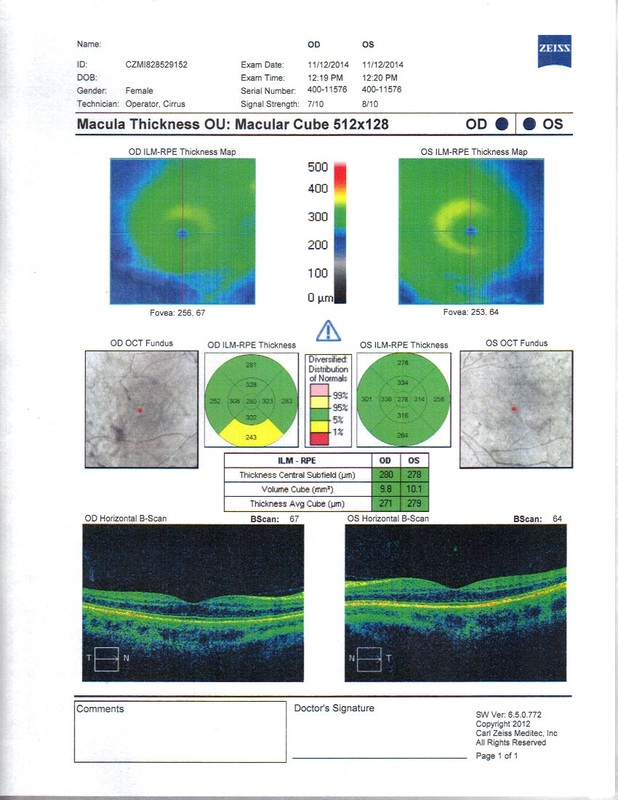 These green slices are in the “temporal” quadrant, indicating that this particular region in both of my eyes is mostly unaffected (my thinning shows up mostly in the so-called nasal, inferior and superior quadrants). An unsettling aspect of my MS diagnosis is that, in every paper I’ve read about the thinning pattern of the RNFL in MS patients, the thinning is most pronounced in the temporal quadrant. 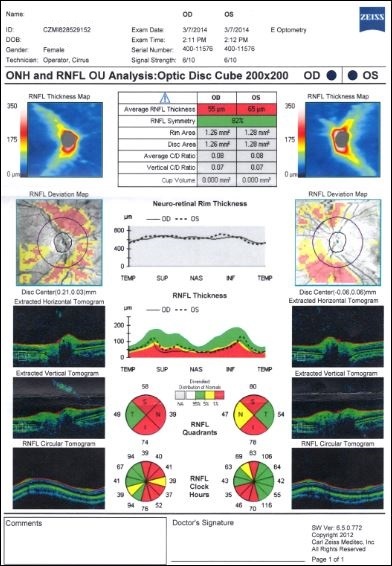 For example, in a paper comparing eyes of MS patients to those with glaucoma:”the extent of RNFL thinning varies across quadrants in MS/ON eyes with the highest degree of RNFLT loss in the temporal quadrant”. In another paper, comparing the eyes of MS patients to those of NMO: “… [in MS patients] RNFL thinning showed a clear temporal preponderance”. (This last paper was particularly informative and well-written, with lots of colorful OCT scans to look at. The authors mention that there are other diseases that preferentially strike the temporal quadrant of the RNFL, such as “Leber’s hereditary optic neuropathy, OPA1 related dominant optic nerve atrophy, and spinocerebellar ataxia type 1”). But back to the point: if temporal RNFL thinning is a hallmark of MS, then why is this quadrant of my eye the only one that seems to actually be holding onto its axons? 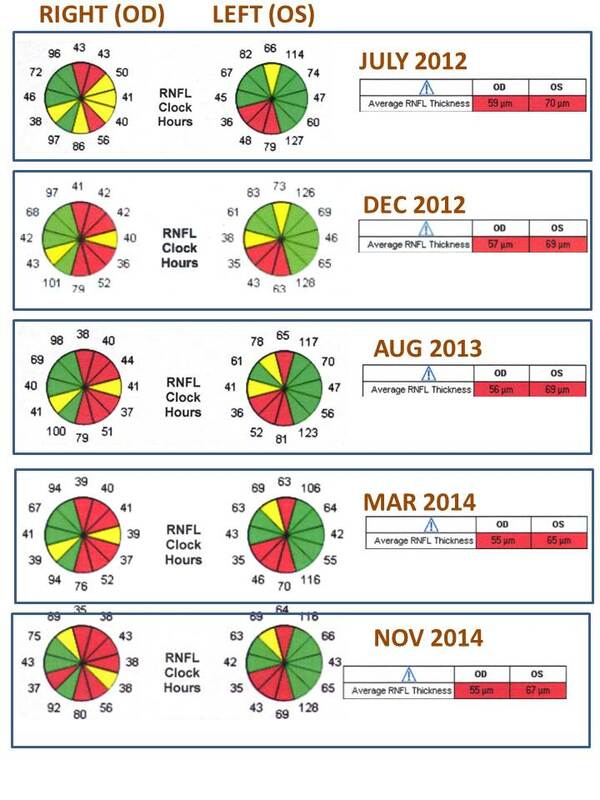 An easier way to look for global changes is to plot up all the measurements of the average RNFL thicknesses. Below is the plot. The upper set of points (the squares) shows measurements of the left eye (average thickness over all the “slices” shown in the first plot), and the lower set of points (the diamonds) is of the right eye. The colors of the symbols indicate the quality of the scan. The lightest colored points represent the poorest quality (a value of 0.6 or less, which is considered to be “unacceptably low” by many papers I’ve read on the topic, but also seems that for really thin eyes like my right one, getting a higher quality reading is difficult). The medium gray indicates an acceptable measurement (quality between 0.7 and 0.8). The black represents an outstanding quality (0.9 or better). The left eye does show over-all thinning, but at a lower rate than the right eye. 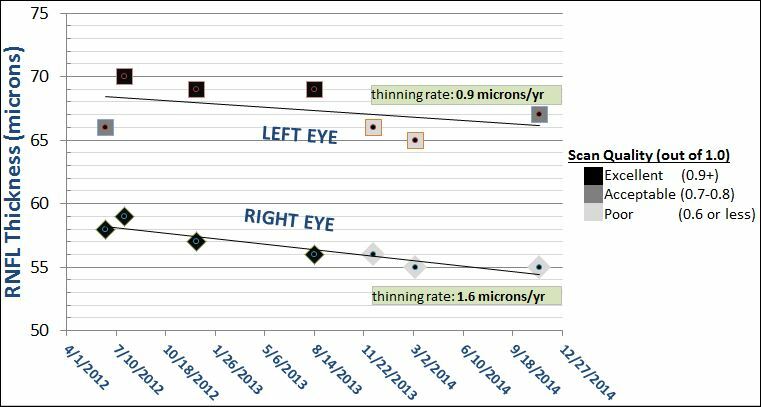 If you believe the least-squares linear fit, the thinning in the right eye is 1.6 microns per year, and the left eye is losing at a rate of 0.9 microns per year. To put these numbers in perspective, the average thinning of healthy eyes due to aging is about 2 microns per decade, or about 0.2 microns per year. If you discount the very first measurement in the left eye, which seems like a bit of an outlier (despite its very high quality rating), then the rate of loss in the left eye is almost identical to that of the right. 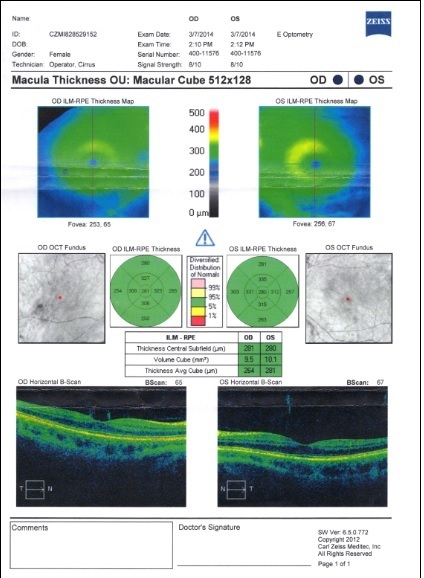 (Recall that I’ve had clinical optic neuritis only in my right eye, back in 1997). In short, both the neuro-opthomologist and optometrist said that my eyes definitely do not look like those of a glaucoma patient. At this point, I think that I have nearly put that question “to bed” and no longer worry that I may be walking around with an untreated and serious glaucoma situation. Doesn’t mean that MS is the underlying reason for the optic neuropathy, but glaucoma is now checked off the list as a prime suspect. Progress, no?! The neuro-opthomologist posited that I “could have been born” with low RNFL thicknesses, and that the differences in the measurements over these past 2 years are insignificant and well within the uncertainty of the OCT scan (which he said was about 5 microns). He also suggested that I stop getting scans so often, that one a year or every 2 years would be sufficient. I was a bit annoyed at this statement, as (1) I pay out-of-pocket for these scans, except for the annual one that my insurance covers, and (2) when is more data a bad thing, especially when looking for a trend? As a scientist, I outright reject his suggestion. This post shows the scans from 2 years ago, if you are interested in comparisons. The optometrist expounded a bit on ruling out glaucoma. She said that in patients with glaucoma with RNFL this thin, the patient is well on the way to blindness, the disease would have tremendous momentum and even pressure-reducing eye drops wouldn’t be able to stop it (she said that in such a patient, one might see as much as 20 microns per year thinning rate). She said that in the 2 years I’ve been monitoring my eyes, I would have had significant blindness, and the fact that my vision is still very good is indicative that my eyes are not suffering from glaucoma. Although I realize that there is a lot of measurement uncertainty in a single point, I can’t help from noticing that the last measurement of both eyes show a leveling-off in the thinning. Is this the first indication that the thinning has slowed down? Has 2 years of Copaxone actually helped? Too early to tell, but a true leveling off would be super news. Hope everyone is enjoying the celebration of whatever holidays are appropriate to you and yours this season!